Clue: When was the last time you heard nice things about SPARC Linux? Hot Chips Fujitsu chose 64-bit ARM CPU cores for its upcoming exascale supercomputer for two reasons: Linux and the ability to customize its own processors. It was a bit of a surprise when the Japanese IT giant picked ARMv8-A over SPARC64 and x86 for its Post-K beast, which will be used by Japanese boffins to carry out climate-change modeling and other simulations. The roughly 1,000 peta-FLOPS Post-K, due to go live in 2020, will supersede the Sparc64 VIIIfx K Computer, which today is the fifth fastest known supercomputer. Toshio Yoshida, director of Fujitsu's processor development division, told The Register on Monday that it chose ARM over SPARC due to ARM's larger and healthier software ecosystem. Supercomputer applications typically run in Unix-flavored environments, which is a fancy way of say Linux. Fujitsu figured that ARM Linux has more support and features, such as KVM-based virtualized for running guest machines, than SPARC Linux. Fujitsu took the view that supercomputer software support for SPARC just wasn't going to hold up in the long run, and wanted a platform that has tons of developers and familiar tools. "ARM has the best software ecosystem for us," said Yoshida. Now, KVM isn't a deal-breaker for supercomputing. It's nice to have but not a fundamental requirement. So what else encouraged Fujitsu to adopt ARMv8-A? Well, we also hear that RIKEN, the research institution that ordered the K Computer successor, urged Fujitsu to consider an alternative to SPARC. 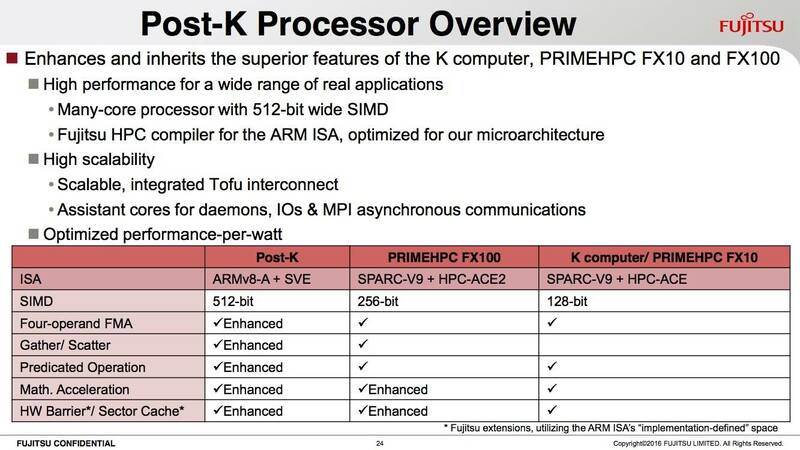 This pressure helped the IT contractor make up its mind about ARM: SPARC's no longer any good, there's plenty of software and support for ARM, and nice kernel features too, so why not just go with ARM? But why ARM – why not just use x86 chips from Intel, which has a huge ecosystem and is the dominant compute architecture in data centers? Fujitsu wanted to customize its processors to suit its exascale needs, said Yoshida. With ARM, it can license the ARMv8-A architecture and build a system-on-chip around the 64-bit cores, add acceleration units, support its Tofu data interconnect, and work in other features it plumbed into its SPARC64 VIIIfx SoCs [PDF] in the K Computer. This approach also allowed Fujitsu to work with ARM to develop SVE – Scalable Vector Extension – and add it to ARMv8-A, an effort that was announced today. SVE brings long SIMD vectors to the 64-bit ARM world, allowing cores to operate on multiple arrays of data at a time, where each array stores a string of 16, 32 or 64-bit integers or floating-point values up to a total of 2,048 bits per vector. ARM's Nigel Stephens describes the technology here. Thus, compilers can be updated to use these new SVE instructions and features, and Fujitsu can glide from SPARC64 to ARMv8-A, rebuilding applications to harness the new architecture, and provide a common Linux environment on top of its chips. The Fujitsu Post-K machine will support 512-bit SVE vectors. Yoshida told us the addition of SVE makes ARMv8-A ready for supercomputing; prior to the extension's development, ARM's stock SIMD engine NEON supported just 64- or 128-bit vectors, which just isn't enough for high-performance computing. For one thing, Intel's architecture offers support for 512-bit vectors and ARM had to catch up.